Twin reapers were chosen by the gods as protectors of their world and blessed with sacred magic. But will it be enough? 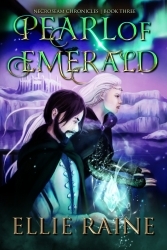 "Pearl of Emerald" is Ellie Raine's third book in the NecroSeam Chronicles, an original "scythe and sorcery" fantasy adventure set in an alternate world like no other. This is a totally different take on dark fantasy, where "Reapers of Death" are honorable knights sworn to protect souls and kill demons. Be the first to own a signed copy for a special price at ATL Comic Con. Atlanta, GA, July 04, 2018 --(PR.com)-- ScyntheFy Press announces the release of "Pearl of Emerald, NecroSeam Chronicles | Book Three," by Ellie Raine, a fresh new voice in Epic Fantasy. This mind-bending adventure starts in Book One, "Willow of Ashes," when an apprentice reaper named Xavier vanishes into the ocean and his soul ends up trapped inside his twin brother. The co-existing necromancers surface up to the Land realm to begin a search for Xavier’s missing body, only to discover this realm is infested with an army of soul-devouring demons. In Book Two, “Orbs of Azure,” the quest for Xavier’s body is put on hold yet again as tensions between the reapers and Land realm escalate into full-out war. When their comrades are taken captive, the twins join Death Princess Willow on a rescue mission, encountering important allies from all five realms, all of whom are searching for a legendary hero named “Shadowblood”... someone who looks just like the twins, if they had been born as one. Now in Book Three, “Pearl of Emerald,” the world of Nirus is entering a time of discord. The Land realm is on the brink of a civil war as rumors of their lost royal Relicblood’s return continue to spread. The war between the realms is threatening the fragile balance of this world. Even the Demon kingdoms are fighting amongst themselves. Caught in the middle are twin reapers who may have a bigger part in this dark adventure than ever imagined. After six years trapped inside his twin, Xavier’s soul is finally back in his own body, although his long years in a soulless coma has left him physically weak. Death Princess Willow is thrilled to have her fiancé back, but her duties as Grim’s emissary takes precedence now that the Reaper’s war with Everland has intensified. The twins sail with Willow on a diplomatic mission to the icy glaciers of the Ocean realm before continuing on to the lush forests of the Neverland continent. But the ruthless new queen has laid an ominous trap for the legendary Shadowbloods, and the reapers are sailing right into it. All formats (eBook, Paperback, Hardcover) of “Willow of Ashes,” “Orbs of Azure” and “Pearl of Emerald” are now available everywhere, including Amazon.com, BarnesandNoble.com, Apple.com/ibooks, and other online bookstores. Ellie Raine will also be selling her books and artwork at Atlanta Comic Con from July 13 – July 15, 2018. Come to the ScyntheFy Press booth in the Artist Ally (#F-17) for special deals and giveaways. Ellie Raine grew up in a family of book lovers, comic readers, and video gamers in the suburbs of Norcross, Georgia where she always dreamed of making the next explosive game series that would catch fire like the Final Fantasy games, except hers would have darker themes that put the spotlight on her favorite fable: the Grim Reaper. But that plan took a detour after she went to the Art Institute of Atlanta to make that dream happen. In the midst of her drawing classes, she made the mistake of taking a creative writing course from which there was no return. Her ongoing Scythe-and-Sorcery book series, The NecroSeam Chronicles, was originally intended to be that explosive video game series, but she's found that the book adaptation is far more fulfilling and exciting. Besides the NecroSeam Chronicles series, Ellie Raine’s other works includes a supernatural-noir novella titled "Nightingale" that was published with Pro Se Productions in 2018. All her books are available on amazon.com and other online bookstores.